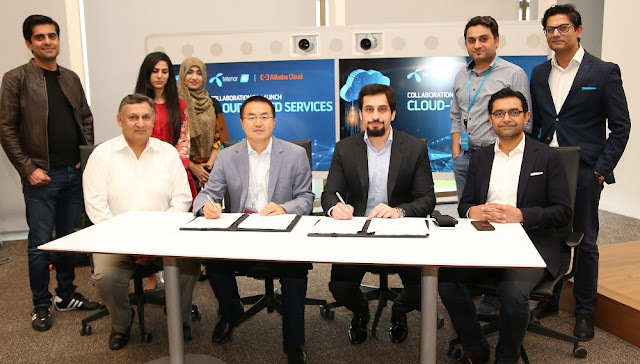 Telenor Pakistan, the country’s leading telecom and digital services provider, has partnered with Alibaba Cloud, the cloud computing arm of Alibaba Group, to become an authorized distributor of Alibaba Cloud products and services in Pakistan. The signing took place at Telenor Pakistan headquarters ‘345’ where Dr. Alex Li, General Manager, South Asia of Alibaba Cloud and Sardar Mohammad Abubakr, Chief Digital & Strategy Officer at Telenor Pakistan, sealed the partnership. Through the partnership, Telenor Pakistan will be selling Alibaba Cloud’s suite of business solutions to local enterprises across the country. The collaboration will allow customer organizations to protect their business critical applications and data with world-class security as they choose to migrate to Alibaba Cloud. In today’s increasingly digital world and exploding data needs, organizations are fast moving to cloud services instead of buying and managing physical servers to have their data management and security needs met. Processing data in the cloud also means that as the business grows, it can keep up with increased traffic. Alibaba Cloud provides cloud computing products in computing, database management, networking, security, and storage that can be deployed globally. The service delivers superior results in all product capabilities ranging from computing, user & network management, and security & compliance to scaling, developer services, enterprise integration, and management tools. said Sardar Mohammad Abubakr, Chief Digital & Strategy Officer at Telenor Pakistan. “We are happy to partner with one of Pakistan’s top digital service providers for distribution of our suite of cloud products and services in the country,” said Dr. Alex Li, General Manager, South Asia of Alibaba Cloud. The partnership will further our vision of fostering the development of the cloud market in Pakistan and help the country move faster towards its digital transformation goals,” he added. Through this partnership, Telenor Pakistan will be providing Alibaba Cloud’s services exclusively to its business customers to further their scale, accuracy in analytics and business security.